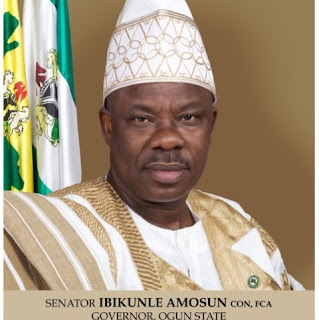 The Court of Appeal sitting in Ibadan on Thursday upheld the judgment of the Governorship Election Petition Tribunal delivered on October 23 in Abeokuta which upheld the victory of Governor Ibikunle Amosun of Ogun. The five-man panel of the Appeal Court headed by Justice H.M Ogunjimiju unanimously upheld Amosun’s victory and dismissed the appeal filed by Mr Adegboyega Isiaka of PDP. Ogunjimiju held that Mr Benjamin Ibikunle, the Principal Witness , PW9, for the appellant was not a credible witness, adding that his testimony could not be relied on by the court. She said that the evidence of PW9 was biased and could not be given any probative value because he informed the court that he was a member of PDP and could go to any length to ensure victory for his party. The judge said that the report of the witness was inconsistent and that there was no doubt that he did not take part in the inspection of the electoral materials. The panel said the court could not give any probative value to the testimony of the witness because he was not an expert. It said that only an expert opinion could be given probative value by the court, adding that the tribunal was right in dismissing the petition. The panel said that there was no place that the number of voters exceeded the number of those accredited and that the election complied with the provisions of the Electoral Act. It said that the appeal lacked merit and dismissed it while declaring Amosun as the winner of the governorship election of April 11.